I've missed the last few weeks of sketch challenges on SCS - and had time to participate using today's sketch. I can see using this sketch with many sets I own! 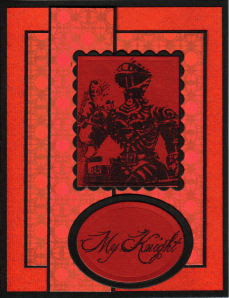 Here's I've used My Knight from Artistic Outpost - stamped in Black on Dark Autumn Red card stock from WorldWin Papers. I was trying to match the red in the Cosmo Cricket Chemistry paper - and this was as close as I could come to a match. What you can't see in this photo is the sparkle on the Noir Sparkle and Re-Entry Red Pearlescent papers - it's really pretty IRL.